At the MHBPNA Blog we welcome guests writing posts and here is one about the Guelph Street Garden. Guelph Street Community Garden – How to Water a Garden without Water? If you haven’t been to the Uniroyal Goodrich Park on Guelph Street lately, you will be amazed by the community garden that is being tended, weeded, nurtured and harvested there. Now that the garden is fully planted, a fence constructed, and a shed procured, the gardeners are working to solve the biggest challenge: WATER! Gardeners have discussed building a structure at the park that would give us a roof for rainwater collection. We approached the Parks Department staff from the City of Kitchener to discuss this option and received positive direction that we can pursue this project. In case you’re wondering, we have already exhausted every possible option we could think of – filling our water storage cubes by hose from a neighbouring tap, trucking in water, filling from the fire hydrant, etc. We ‘ran dry’ on all of these options. In the end, rain water really is the best for watering a garden. The image below is a sketch drawing of the proposed rainwater collection structure. The design would allow for additional uses by everyone in the neighbourhood e.g. community events, garden workshops or neighbourhood potlucks. It could be a multipurpose structure that encourages more people to use the park for small gatherings and events. And don’t worry, formal dress is not required in order to use the pavilion! 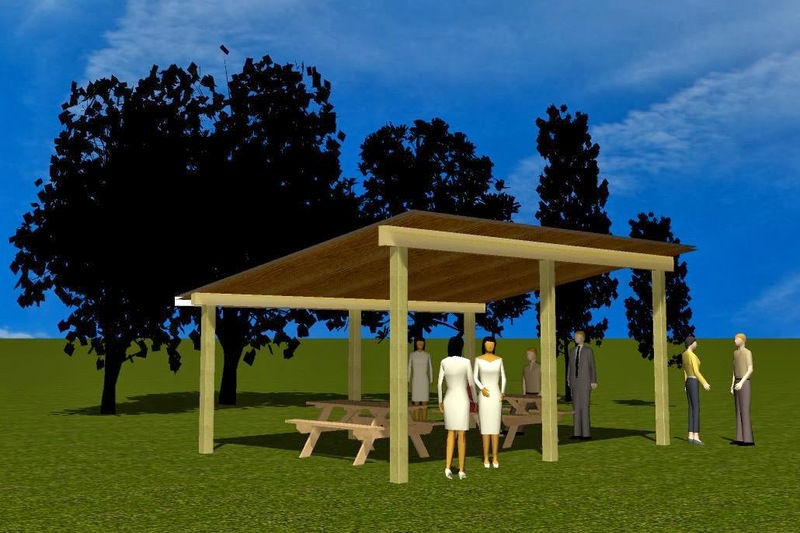 As we prepare a grant application to fund the building of the structure (constructed of wood frame & steel roof) we want to get input from the neighbourhood – send is your additional ideas, comments, feedback and questions. Post them in the comment section below or email them to the Guelph Street Community Garden (guelphstreetgarden@gmail.com). Please send your feedback or comments by Wednesday October 2 as we are preparing the grant application for submission by October 15. Even better, drop by the “Open Garden” event on Saturday September 28 between 3 – 5pm. We’ll have copies of the proposed structure and you can share your ideas in person. We look forward to hearing from you and see you on Saturday at the Guelph Street Garden, Uniroyal Goodrich Park, Guelph Street. 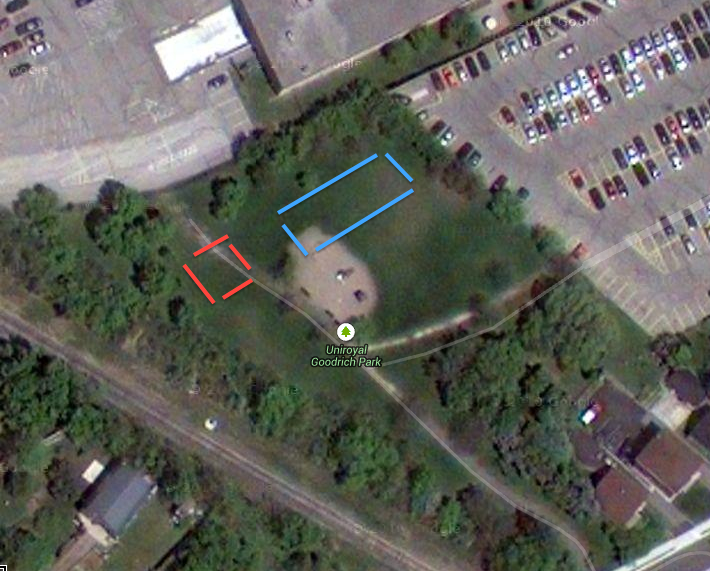 Here is a rough overhead representation of the garden area (blue) and the proposed pavilion (red).